I posted this Cold Beet Soup Recipe originally 9 years ago exactly. It’s an unusual and funny coincidence that I’m posting it again on exactly the same date just almost a decade later. Nine years ago I made this Cold Kefir Soup dozens of times during a very hot summer. 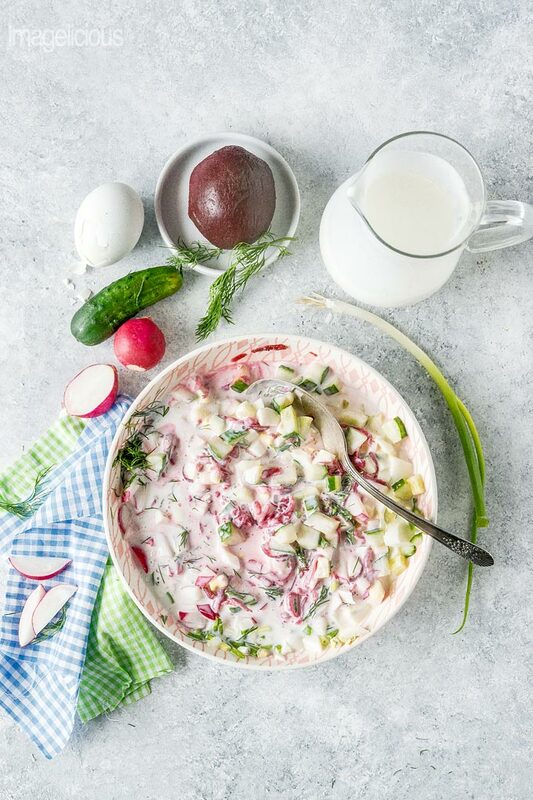 Then I met my husband who doesn’t like kefir (or yogurt or sour cream or buttermilk or any other dairy except milk and cheese… I don’t even know how we are still together… end rant) and stopped making this refreshing cold summer soup. Now that I am staying home with my adorable daughter (who also doesn’t like kefir or yogurt or sour cream or buttermilk or any other dairy except cheese… I don’t even know how she’s my child… end rant), I get to make Cold Beet Soup for lunch for myself. And what a delicious and easy and healthy lunch it is!!! 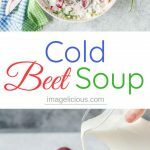 What are the origins of Cold Beet Soup? 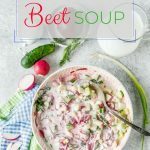 If you google Cold Beet Soup, you’ll get many recipes that state that the soup is either Polish or Lithuanian or Latvian or Russian. According to a wiki page (which I know is not really an authority), it is most likely Lithuanian. However, it’s really popular in Russia and it even has its own name: Kholodnik or Svekolnik. 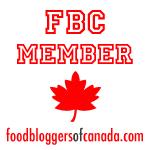 Do you like beets and want more beet recipes? Check out this delicious roundup of 27 Unbeatable Beet Recipes! What are the ingredients in Cold Beet Soup? Beets, of course. Then there are a few other ingredients that are different from recipe to recipe. Just like with American Apple Pie, there are many different variations of this Cold Kefir Soup. Some swear by using pickled beets and say that without them this cold summer soup would not be the same. Some say that the recipe must contain potatoes. I love using Love Beets brand because it makes making this soup very easy. I get them at Costco. Kefir. Some use buttermilk but I use Kefir exclusively. Sometimes I am asked about the taste of this concoction. How does it taste? 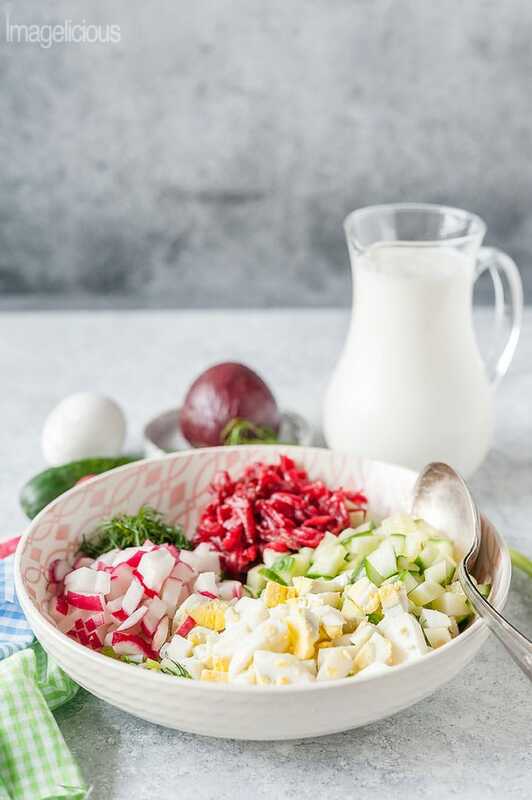 Well, all those ingredients without kefir make a pretty good salad, so it’s sort of like a salad with lots of dressing, a.k.a kefir. Try it, it’s great!!! 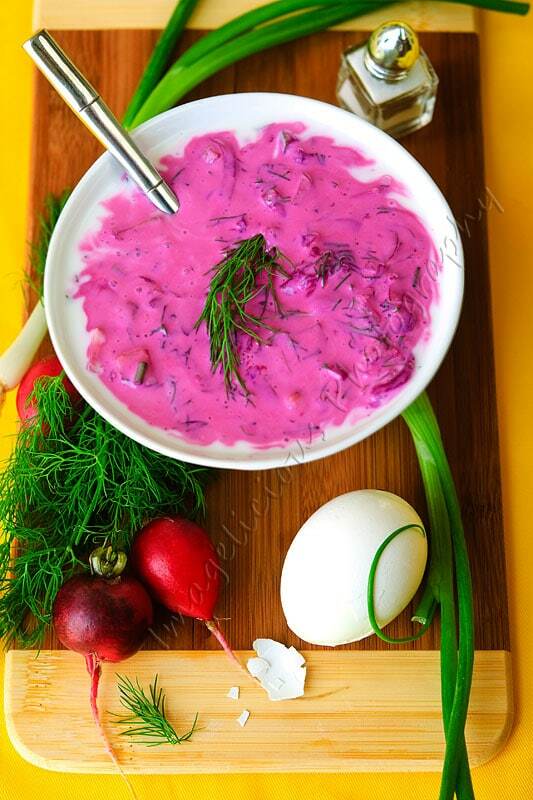 TIPS to make this Cold Kefir Soup easy: If you can’t buy pre-cooked beets, then just cook a few with your preferred cooking method, peel, then keep in the fridge. They will keep for about a week or 10 days. Hard-boil your eggs and also keep in the fridge. 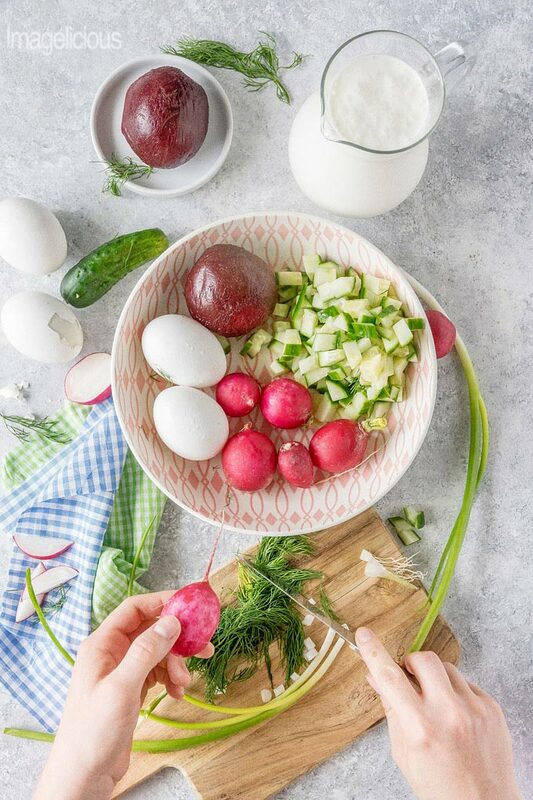 Once you have eggs and beets cooked, chopping the ingredients and assembling this cold summer soup will take only 5 minutes. Alternatively, you can pre-chop all the ingredients and keep in separate containers in the fridge for up to 2 days. Then you can assemble the soup in no time. TIP: Make sure that all your ingredients are cold. This Cold Beet Soup tastes much better cold rather than room temperature. 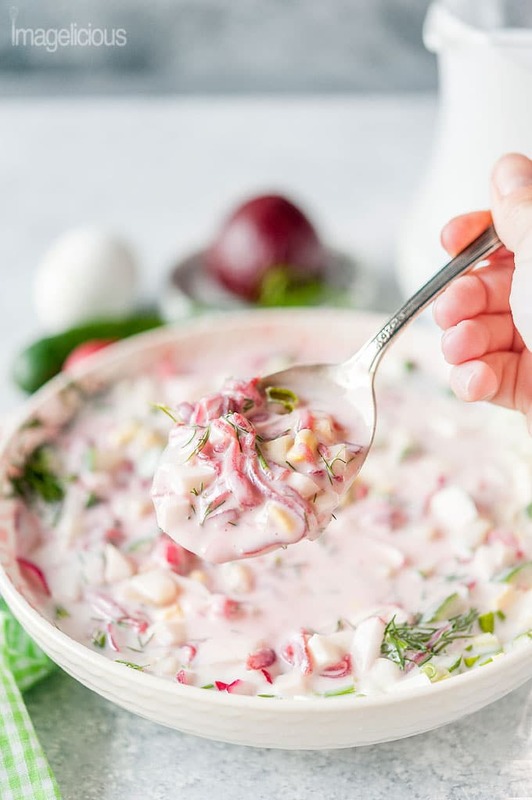 Can you make Cold Kefir Soup without Beets? Sure, you can! In fact, half of the time I don’t add beets at all. 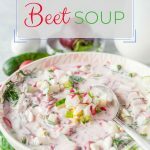 If you don’t have time to cook beets but you want to have a delicious and refreshing Cold Kefir Soup, then just omit the beets! It’ll be just as delicious and just as refreshing! 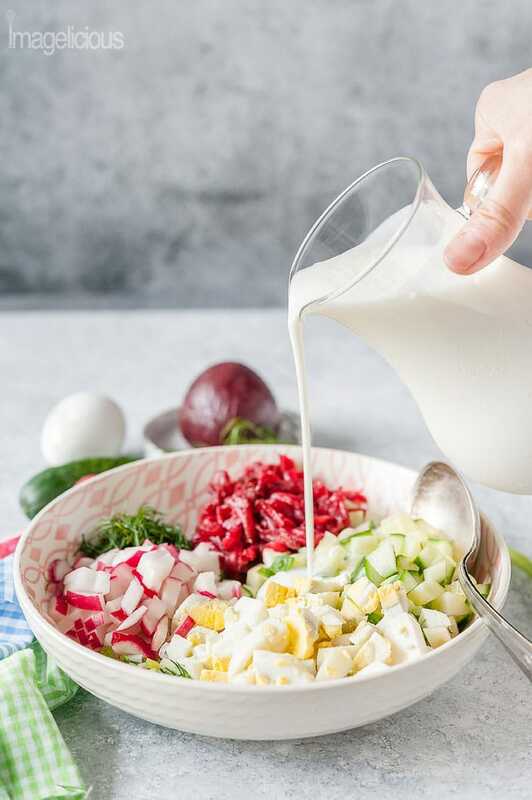 What if you don’t like Kefir? 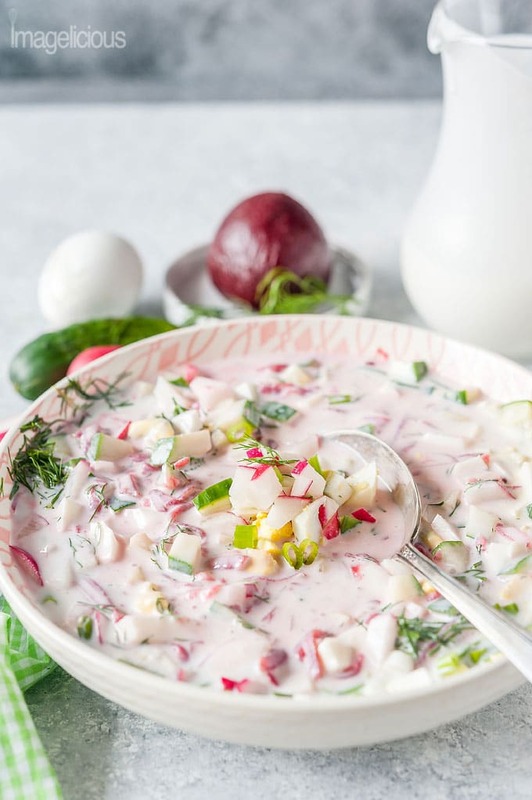 Well, if you don’t like kefir but you would still like to have a delicious Cold Summer Soup with the same ingredients then you can go old-school Russian and make Okroshka. 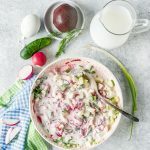 It consists of pretty much the same ingredients but uses Kvass instead of Kefir. Kvass is a rye bread fermented drink and it’s absolutely delicious! 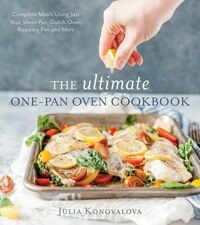 What can you make with all the leftover Kefir? 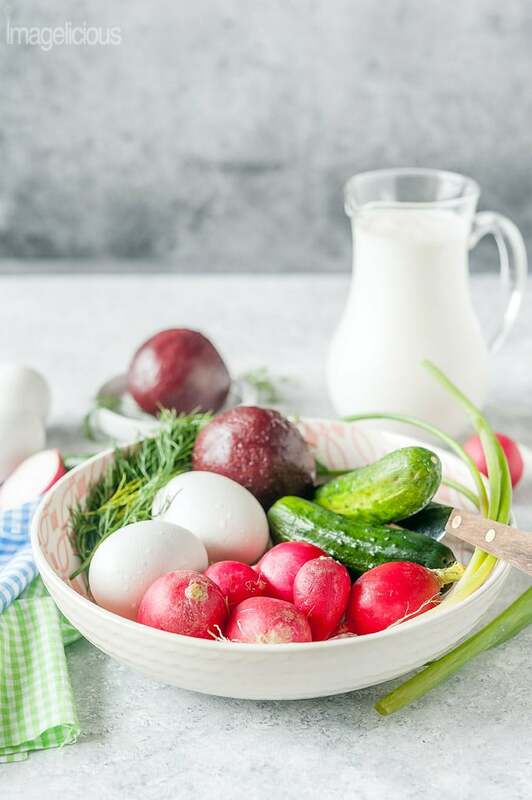 Kefir is usually sold in the yogurt aisle of your grocery store and it’s available almost everywhere. If, however, you can’t find it, you can learn How to Make Milk Kefir from Sarah at Champagne Tastes. There are so many variations of this delicious soup! Add more of this or less of that. Play around with it. Make it different and exciting every single time! Finely chop the rest of the ingredients. Add all the chopped and grated ingredients to a bowl. 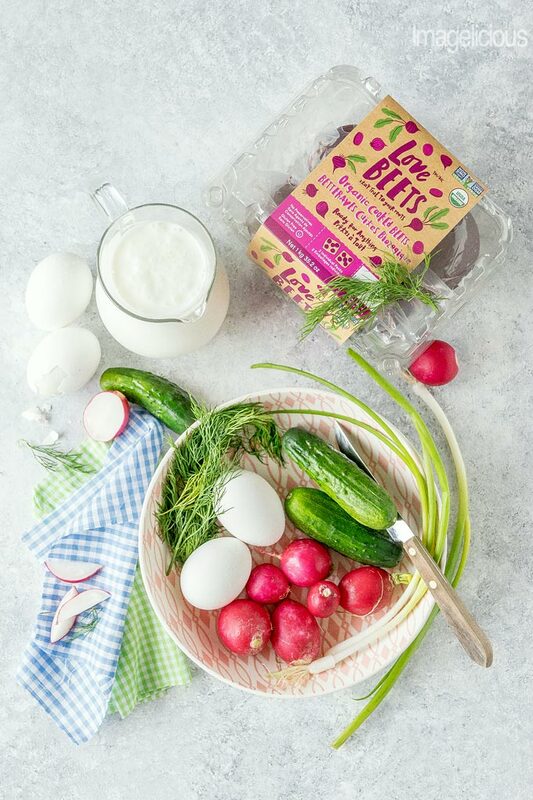 Pour kefir over the ingredients and mix. Add enough salt to taste. You can pre-chop all the ingredients a day or two in advance and keep them in separate container in the fridge. I am Lithuanian and we never use pickled beets for this soup. It is so perfect for the hot Louisiana summers! Lithanians often eat it with hot boiled potatoes and bacon or pancetta bits. My daughter asked me to make this recipe for dinner, and I have to admit – I was a little hesitant. I barely like beets and I’ve never heard of kefir so it was definitely an adventure creating this soup, but I was wonderfully surprised by how delicious it turned out. Thank you so much for sharing! I love the presentation of this soup, Julia! It’s so different from any other beet soups I’ve seen, which are always a bright pool of fuchsia. Which is also pretty! But this is prettier because you can see all of the textures and ingredients! I love this concept! What a beautiful soup and a great healthy lunch idea. Thanks for the inspiration! I am in Latvija now and this soup is ALWAYS made with marinated (pickled) beets. 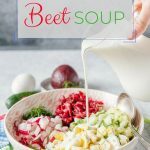 While you might get the color right with boiled beets, the flavor of the soup will not be the same at all. In the USA you can buy pickled beets in the can but you will have to grate or chop them yourself. Try baking the beets rather than boiling them. Also, make it a day in advance to let the flavors really meld. My grandmother used to make this for me when I was a kid. I forgot about it until I went to Riga on holiday. So good!! Yes, I bake beets now. I try to bake more than I need and then keep them in the fridge for later. Haven’t made this soup in a few years now. Time to change that!! !